Columbines (Aquilegia) are great spring flowers for the part shade garden. Our native columbine with its smaller orange flowers held well above the foliage is an important early food source for hummingbirds, when there’s not a lot of food available. Granny bonnets are double flowering types with nodding flowers and my sister’s favourite. They come in yellow, orange, red, pink, purple, blue, and white and some have quite large flowers, like Origami Yellow pictured below. Their foliage can sometimes start to look a little old during the summer, but I just cut them back at this point. Hellebores are among my all-time favourite plants. I’m sure I’ve mentioned them here a few times already and I have over 30 different varieties and species planted around my place, mostly on the north side of my house. They are usually the first perennial to bloom, sometimes through the last bit of snow and are happiest in partial shade. Being up that early is great for the honeybees as they are just coming out of their winter rest and are really hungry. They make great Mother’s Day gifts since, in a normal year, they’re always blooming in our climate at Mother’s Day. I threw in the normal year caveat because of this year: for the first time, I only have seven of them blooming this weekend. Of course, I’m always further behind everybody else since I’m in a forest and this was definitely not a normal year. They have evergreen leaves, but I tend to cut them back in the early spring to make the flowers stand out more. They’ll grow more leaves after they’ve finished flowering. While there are many species and hybrids, most can be put into two unofficial categories. Orientalis hybrids, like Onyx Odyssey pictured above, are what most people first started with. They generally have bright green foliage, get about two feet tall and have nodding flowers in singles and doubles. There are a lot of seed grown varieties, which means that the flowers can vary between them. It’s not uncommon to see one flower with pink edges to the petals and red markings inside while the next one over is solid in colour, even though they are the same variety. If you’re particular about exactly how you want the flower to look, it’s better to buy these types in bloom. The second major group are the upright ones, for lack of a better term. These newer hybrids really started taking off four or five years ago. They have single flowers in shades of green, white, and pink. Their flowers face upward and outward, so they really stand out and when they finish, they turn shades of purple, pink, rose, tan or green and hold that colour for quite a long time before drying to a light tan. These finished flowers will usually stay on the plant for most of the year, like a Hydrangea. They tend to be a little shorter at 18 inches or less, depending on the variety. 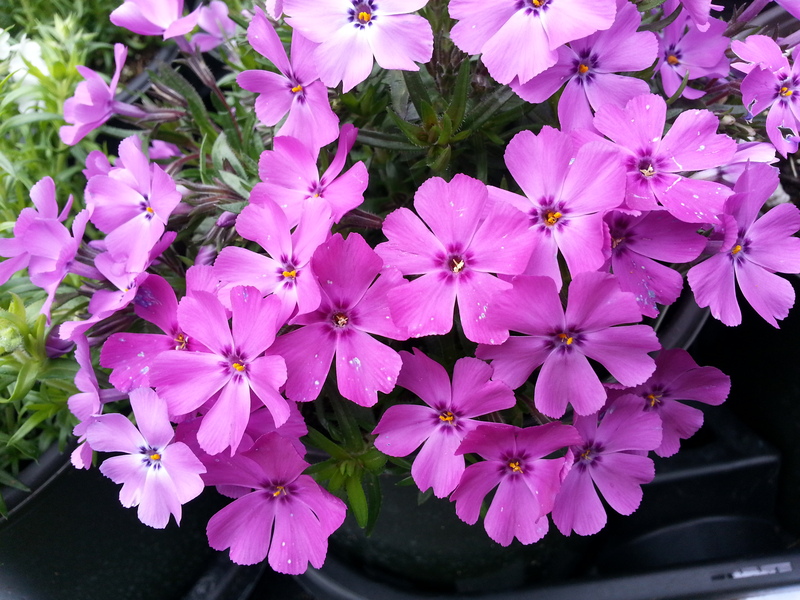 Another plant that heralds the arrival of spring is creeping phlox. I always forget about until, inevitably, someone comes in asking a carpet for bright pink flowers that they saw while out for a walk or a drive. These tough little perennials thrive in full sun and neglect, never needing water after they’ve been established, even with my ultra dry sand. The small flowers are massed, literally covering the whole plant, and come in white and various shades of pink and blue (gardener’s blue which is tongue in cheek for purple). They have a darker ‘eye’ when you look more closely at the individual flowers. This entry was posted in Plant Focus and tagged aquilegia, columbine, creeping phlox, flowers, hellebore, helleborus, Monte Cristo, mother's day, Origami Yellow, Penny's Pink, Phlox subulata, spring. Bookmark the permalink.